Vibrant and colorful angel figurine features carved artisan design with engraved Scripture verse and rhinestone accents. 5.5" tall angel wearing blue and holding a butterfly; I can do all things through Him who strengthens me. Philippians 4:13. 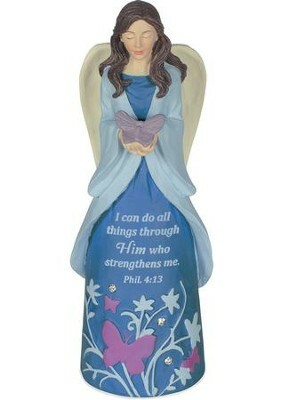 I'm the author/artist and I want to review I Can Do All Things Through Christ, Angel Figurine.